A unique collection of Stalin-era pictures from the USSR uncovered by an American historian has taken both the internet and international media by storm. RT has spoken with the man who’s brought the rare images to light. Being behind the discovery of the archive that belonged to former US diplomat Martin Manhoff was “sort of a happenstance,” US historian Douglas Smith told RT, saying he hadn’t personally known the diplomat who took the photographs in the Soviet Union before being deported back to America on espionage charges. “Last summer I got a call from a friend who heard about an elderly couple [in the Seattle area] who had passed away, and the people who were getting rid of their family materials stumbled upon all of these Russian books, papers, maps, photographs, slides, and films. They didn’t really know what it was or what they might do with it, so they got in touch with me and brought me over to the house. I started to go through it and I immediately realized this was a really remarkable find,” Smith said. “The color is really what struck me when I first took them out and started to view them. 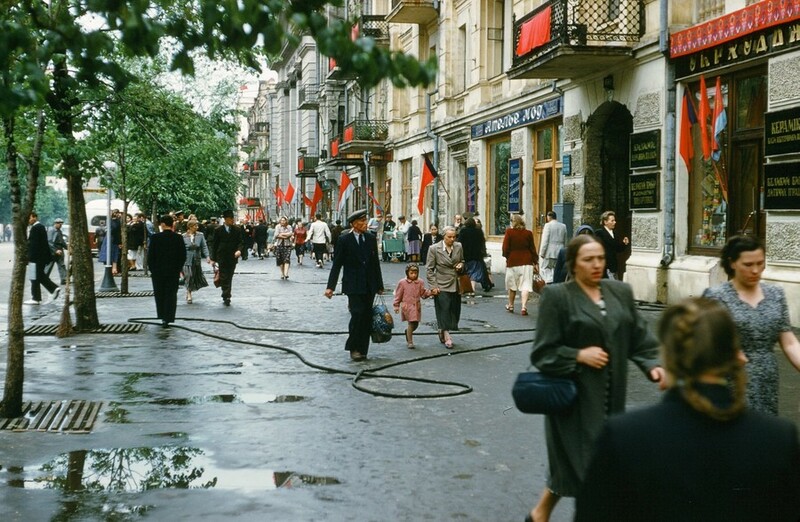 I was blown away by the richness of the colors... We are only used to seeing Stalin’s Russia in black and white for the most part, so to see it come alive in color gives us a radically new view." 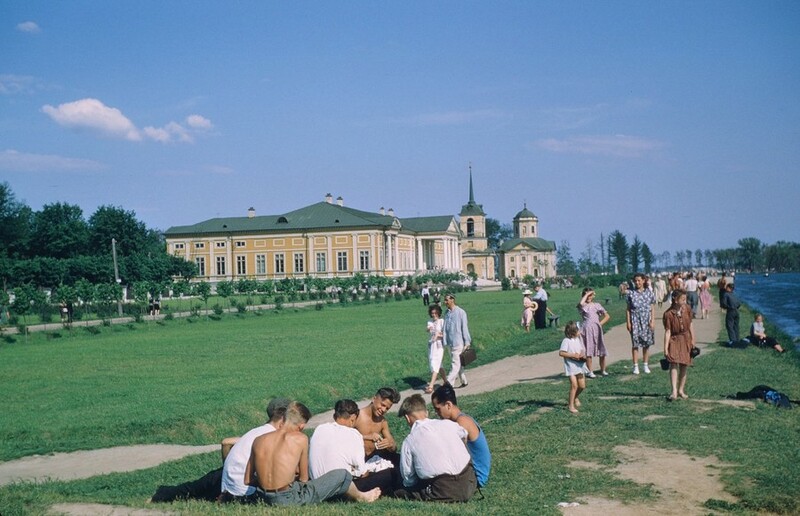 “They are sort of jarring in a way, because obviously the Stalin period was a horrific time in so many ways, innocent lives by the hundreds of thousands if not more were lost, but, still, daily life went on,” the historian said, adding, “horrible things can be going around you, but people still go out; they still have picnics; they still stroll; they still buy ice-cream in the street; they still laugh and they still smile. 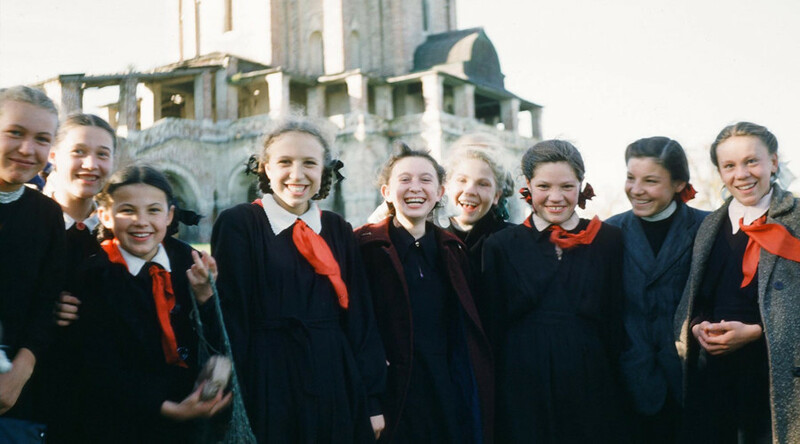 Among Smith’s own favorites is a photograph of girls in school uniforms. 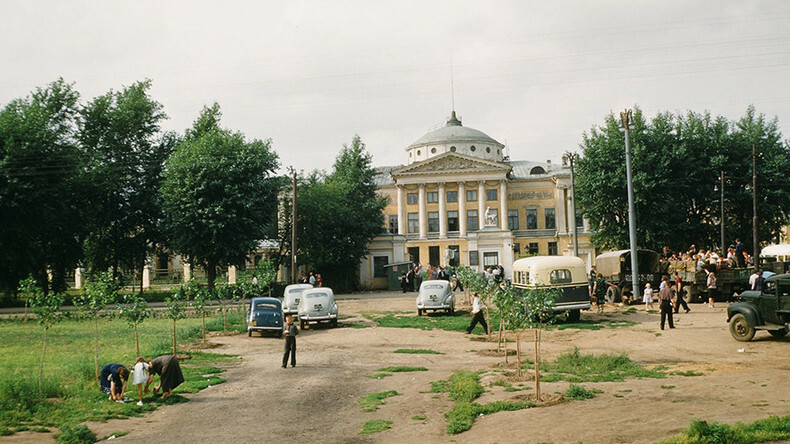 “There was an afternoon when Martin Manhoff went to Kolomenskoye in Moscow. It was a beautiful sunny day and he took a good deal of photographs of the monuments there, and the setting, and of people enjoying the setting. And there was a group of school girls there. He took several pictures of them, and it’s one of my favorites in the collection. They look so free and happy, uninhibited in their school outfits with their red scarves. It humanizes that past, which I think is really important,” he said. “There is a definite historical value. I mean you can appreciate the photographs and the films exactly from an artistic sensibility, but I think, for those of us interested in Russia’s past, they are going to be a very valuable resource in understanding more fully the final years of Stalin’s rule,” the historian told RT. Martin Manhoff’s photographs may make viewers rethink the idea that societies in the West and in the USSR were “radically different” in the early 1950s, he said. “At that time, the sort of formal look was apparent in both places, and it struck me [with] some of the similarities between our societies that maybe we aren’t always so fully aware of. “If you look at how the people are dressed in most of these photographs, how formal things were – women in their dresses, men in suits and sport coats, and always with a certain type of hat on – in a way it’s analogue to the way that the West was at the time as well. It was interesting to see what was going on in the Soviet Union, and it was very similar I think to what was happening here,” he explained. Having researched the man who took the pictures, Smith said that Manhoff, who was an assistant military attaché in the US embassy in the Soviet Union, also had an artistic background. The US diplomat turned photographer was expelled from the Soviet Union on espionage charges. 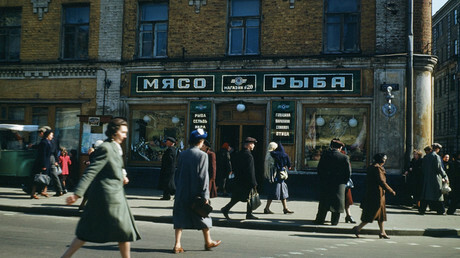 Yet, the historian doesn’t think it had anything to do with his filming or taking pictures in the streets of the USSR. “One of the interesting riddles is why he and several others were kicked out of the Soviet Union in the spring of 1954. It appears to me, from what I can tell having done a bit of research, is that this was sort of a standard retaliation. In February of that year, three Soviet diplomats were kicked out of the United States, and I think this was an answer, a typical diplomatic move. I don’t think there was any spying going on, and the photographs, the thousands of them that I’ve found, do not in any way suggest that they were taken as some sort of espionage plan,” he said. 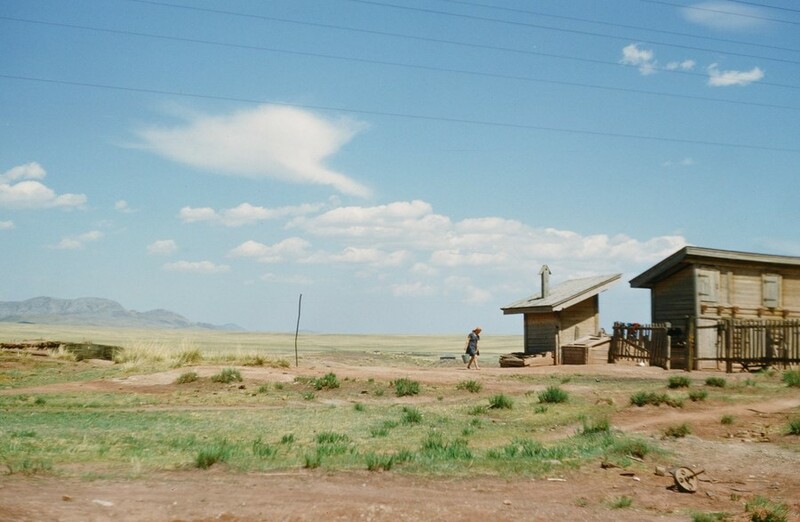 Yet, Manhoff managed to document one of the most remarkable moments in the Soviet history – and in an “utterly unique” way. A 16mm film of Stalin’s funeral in Moscow in March of 1953 is the real, yet to be unveiled, “gem” of the collection. “This was one of the discoveries that made me shiver when I saw it. In a number of cardboard boxes were these old metal canisters of 16mm film. One of them in his hand in pencil read ‘Stalin’s funeral.’ I simply couldn’t believe it! He filmed it from the US embassy, which was next to the Hotel National in the center of Moscow, in a perfect view of the cortege. There is a famous film about Stalin’s funeral called Velikoe Proshchanie (The Great Farewell) and that has a lot of coverage of the funeral too, but it lacks this roughly 10-15 minute period when the cortege moved across Manege and up into Red Square. So, as far as I know, at this point [Manhoff’s film] is utterly unique in what it captures – and it’s all in color,” the historian said. Douglas Smith has promised to share these materials later, as he is “still struggling to make sense” of his “amazing” discovery. “It took months of hard work to get these images digitized. They were still just on slides and in these film canisters, and it’s only been in the last couple of weeks that I have had them digitized and I started to go through them,” he said. So far, the several that the historian has posted on Facebook have “exploded all over the world.” With such a resounding teaser, thousands now can’t wait to see what’s to come.